The Villa do Sol is located at 80 meters above sea level surrounded picturesquely on a steep slope by the gorgeous green of the island. On a 400 sqm plot, the villa is surrounded by an exotic garden with banana trees and citrus. Not for nothing Madeira is called the island of eternal spring. The villa offers 120 m² living space all amenities for a perfect holiday. To get out of the garage by a staircase in the open living room. On the ground floor the spacious fully fitted kitchen with hob, oven, microwave, dishwasher, fridge-freezer and coffee maker. The adjoining modern living room has a TV, free WiFi connection, offering breathtaking views of the sea. Through a sliding window you reach the terrace with the 7,5x4,0 m pool. In addition, there are around the villa further 3 terraces and 2 balconies, so you can enjoy all the sunny hours of the day. Your bedroom is spacious and equipped with a double bed (size 180 x 210) and generous closets. En Suite You will find the bathroom with toilet, shower and bathtub. If you arrive by three to six people, there is also on the first floor of the villa. Here are two more bedrooms with double beds 1x2m and generous fitted wardrobes and an en suite balcony with magnificent sea view. On the upper floor there is also another bathroom with toilet and shower. The en suite bathroom has a bath / shower, sink, toilet and bidet. Upstairs bathroom has toilet, sink and shower. With an occupancy of 2 persons is only the ground floor. We enjoyed very much the combination of the capital funchal and the nature, the mountains, the flowers and the heaven and the sea. Das Haus entspricht der Beschreibung und den gezeigten Fotos. Die Lage oberhalb des kleinen Ortes Ponta do Sol hat ihre Vorteile (kein Durchgangsverkehr, atemberaubende Sicht auf's Meer), aber auch ihre Nachteile (steiler Fußweg in den Ort, gewöhnungsbedürftige Anreise per Auto auf steil abfallender Straße). Die Innenausstattung ist reichhaltig und komfortabel, wobei manche Details (z.B. Klobrille, angeschlagenes Geschirr) erneuerungsbedürftig wären. Insgesamt war es ein entspannter Aufenthalt in einer fantastischen Umgebung. Wunderbares Haus, herrliche Lage. Wir haben uns sehr wohl gefühlt. Die Qualität eines Hauses zeigt sich wenn es draussen regnet und stürmt. Durch die vielen Fenster war es auch an dunklen Tagen hell und freundlich. Es ist ein Domizil zum Wiederkommen. Das Haus ist sehr gut ausgestattet und wunderschön gelegen. Als Ausgangspunkt für Unternehmungen ist die Lage ideal. Der Blick aufs Meer ist ein Traum. Wir haben nichts vermisst und uns vom ersten Moment an wohl gefühlt. Auch der Kontakt zu Rose war sowohl vor als auch während unseres Aufenthaltes prima. Vielen Dank dafür. Wir können das Haus absolut empfehlen. Ein wunderbares, gut ausgestattetes Ferienhaus, geschmackvoll und hochwertig eingerichtet, mit einem atemberaubenden Blick über das Meer. Sehr gute Lage, um die Insel zu erkunden. Herzlichen Dank für Ihre feundliche Rückmeldung! wundervolle Villa, sehr sauber, gemütliche Einrichtung einmalige Lage. Tolle Gastronomie in Fußreichweite. Wir kommen wieder!!! The villa is located in Ponta do Sol (to German: Sonnenspitze), the place with the most hours of sunshine throughout the island. 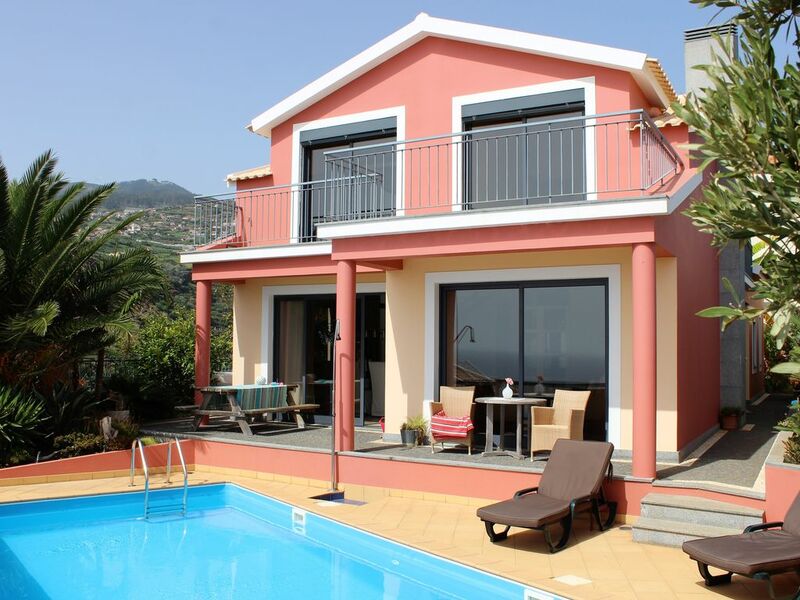 Enjoy the panoramic view from the Villa do Sol both the sea and the mountains. In just 5 minutes you can walk to the center of the charming village, where there are several restaurants, a well-stocked supermarket and a pebble beach.